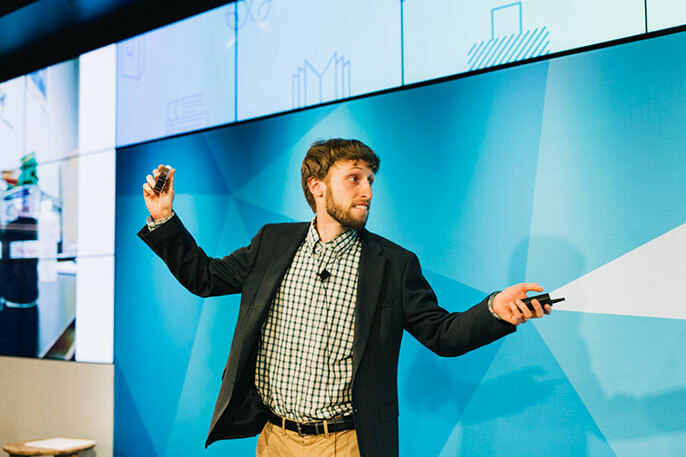 UC Berkeley's Joseph Charbonnet in action during his three-minute, winning talk on stormwater research at the 2018 UC Grad Slam on Thursday, May 3, 2018 at LinkedIn's San Francisco headquarters. A simple method for using sand to make stormwater runoff safe for drinking helped UC Berkeley grad student Joseph Charbonnet snag first place on Thursday, May 3, at UC Grad Slam, a systemwide contest aimed at communicating research. The contest challenges master’s and Ph.D. students to explain their research in three minutes, in a way that will engage and enlighten a general audience. The winning concept, “mansand” — thusly named, Charbonnet quipped, not because it refuses to ask for directions — is sand treated with manganese oxide, which gives it superpowers to filter out toxins and polluting particles that rainwater picks up from the street and sidewalk. The solution, now being implemented in field sites across the state, could be a huge boon to areas like Sun Valley, Calif., which, ironically, spends millions of dollars to import water from Northern California and other areas while its streets are routinely flooded. Watch Joseph Charbonnet's presentation above. Charbonnet’s innovation helped him wow a panel of judges to capture the $6,000 award and the systemwide trophy, known as the Slammy. But the fifth year Ph.D. student was hardly the only one to make the ingenious look easy. Other covered topics included a simple, at-home cancer screening that could dramatically improve early detection and a way to quickly identify stroke that could increase access to lifesaving care. Presenters also amazed and educated the audience with talks on what causes some people with a condition called synesthesia to see letters as colors, how to read the Earth’s climate history in layers of sediment, and how A-listers dressed in ancient Egypt. Grad Slam finalists look on. From left to right, Nicholas Root of UC San Diego, Tooka Zokaie of UC Davis, Alana Ogata of UC Irvine, Yiqi Cao of UCSF, Portia Mira of UC Merced, Joseph Charbonnet of UC Berkeley and Marissa Stevens of UCLA. Now in its fourth year, Grad Slam aims to give emerging scientists and scholars the skills to make their work easily understandable to the public. Thursday’s contest, co-sponsored by LinkedIn and held at the company’s San Francisco headquarters, featured the 10 first-place winners from similar contests that have taken place on each of UC’s campuses over the last three months. The contest was emceed by UC President Janet Napolitano, who also quizzed students on what they did in their free time outside of the library and lab (answers included circus arts, cooking and ballroom dancing) and who they would invite to a dream dinner party. Judging the students were a panel of leaders in education, government and media, as well as members of the audience and viewers at home, who helped chose an audience favorite. To develop their winning pitches, students spent months practicing and getting input from those who often don’t weigh in on their research, from friends, family members and classmates to professional public speaking coaches. For many, learning to connect with a wider audience often involves an approach counter to the specific, highly technical language they use to communicate with colleagues in their field. Audience choice winner Mengya Tao delivered a talk on creating a safer world with fewer regrettable chemicals. For second-place winner Yiqi Cao, the trick was coming up with the right analogy to help people easily visualize and grasp her work. Cao is looking to improve treatment for heart disease by building safer, longer-lasting stents, the tiny devices which doctors insert into blocked arteries to clear them and hold them open. When cells encounter the foreign object, they react by frantically producing proteins and scar tissue that leads to a high failure rate for the devices: Currently, one out of 10 patients needs a new stent within a year. Cao also explained how changing the surface of the stent could force cells to move more slowly, minimizing their reaction. Ultimately, she hit on the metaphor of the difference between how people are able to move across a smooth, paved roadway as compared to hopping over stones to cross a river. “I’ve changed the surface to be more like stepping stones,” she said. UCLA's Marissa Stevens discussed the social identity of Ancient Egyptians in her talk. Marissa Stevens brought the dead back to life with her talk on how she has analyzed the scrolls buried with ancient Egyptians to reconstruct the identities and lives of the people who lived over 2,000 years ago. In analyzing the objects buried with the dead, she learned about ways people used material objects to communicate their personality and social status in a manner that rings familiar to anyone who has watched interviews of stars on the red carpet, or flipped through the pages of People Magazine. Media kit: More photos are available here. Please credit Anastasiia Sapon.